Turn Your Hose into a Pressure Washer! Instantly save over 40% on the EZ Jet Power Washer! 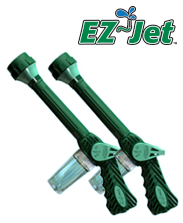 The EZ Jet instantly turns your new Flexable Hose into a powerful pressure washer! You can use it to clean your car, house, fence and much more! The EZ Jet features 8 custom sprays that let you tackle dozens of jobs around your home! With this limited time offer we will send you two EZ Jets for only $19.99 plus FREE SHIPPING! Please select the Buy 1 Get 1 quantity you would like to add to your order!